With the introduction of iOS6, we received and lost features and apps. One item lost was the Apple app for playing YouTube videos. You can still load and play video movies, or watch videos via the ABC and NetFlix apps. But lost was the app specific to playing videos available through YouTube, instead we have had to go to our Safari browser and navigate to our YouTube account. 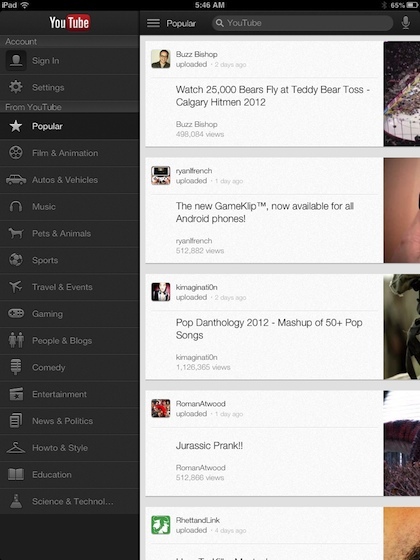 Google brought out a iPhone version of an YouTube app, but it didn’t load nicely onto our iPads. Till this last week, when we found the app go Universal. Meaning, it loads on both iPhone and iPad now, as well has a User Interface that is designed for each device style. Load the app, tap the icon, select a YouTube video and start enjoying the latest for free! Common to iPad apps, using the three line icon or swiping across the screen left to right opens up a selection bar to jump to your YourTube account or a particular group of videos you may be looking for. Voice search is supported via the microphone icon in the upper right corner. 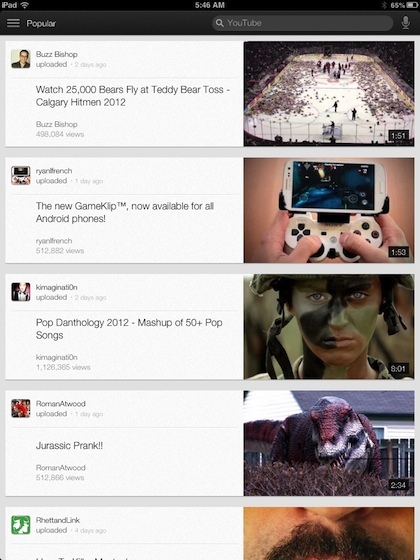 Google was kind in including the feature of AirPlay for the YouTube videos being watch. Like a movie playing in iTunes on your computer, your iPad can stream YouTube videos out via AirPlay to enjoy on the big screen of a TV or projector.